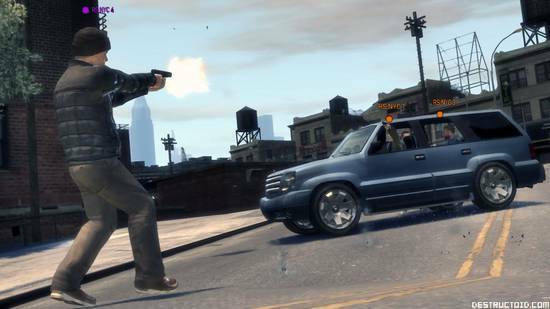 It’s no secret -- Grand Theft Auto IV has multiplayer modes. Surprise! There are at least 15 of them, actually, and the integration is seamless with the single-player experience in a way that’s not unlike what Criterion Games pulled off with Burnout Paradise. 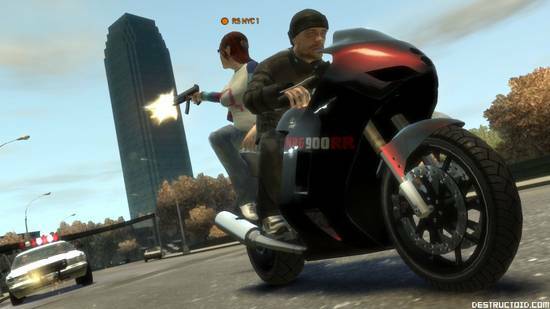 Accessible any time, players can create, join, or search for multiplayer games by pulling out the single-player central character Niko Bellic’s cell phone with the touch of the d-pad. To start, as much as you’d like it to be, GTA IV’s multiplayer is not a full-fledged, persistent massively multiplayer online experience. It does, however, offer a small level of character customization. Before starting our gameplay session, we were given the option to modify our avatar’s appearance. Options like gender, face, hair, and clothing are all available at the outset with limited selections. We were told that these selections would be added as players rank up, between 0 and 10, which can be increased by picking up money across the game’s various multiplayer modes. Besides cosmetics, rank will not have any impact on how the character plays. Like in the single-player game, you cannot upgrade your speed or driving skills, for instance. Everyone will always be playing on an even field, regardless of rank, and the only real incentive to upgrade would be bragging about the fancy new shoes or shirt you unlocked. 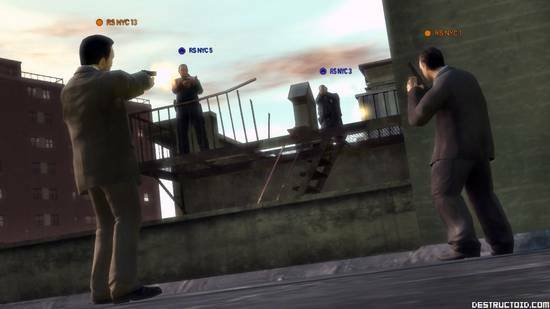 As expected, GTA IV contains standard deathmatch modes, and the first game Rockstar fired up for us was “Team Deathmatch.” This mode can be played with up to 16 players in any configuration, which means anyone with a death wish may choose to go all Scarface on an army of 15 other gamers if they so desire. The host is able to customize the match in a number of ways -- turning police presence on or off, the density of pedestrians, weather conditions, whether or not it will be possible to use auto-aim, etc. Control and gameplay wise just about everything is carried over from the single-player game, from the open-use of vehicles to weapons. One of the key differences, for better or for worse, is in how opponents and teammates are identified, which is by colored nametags that appear over each player’s head (this can be seen in all of the screenshots). This makes it easy to spot opponents in the game’s large, open world, but there’s a catch -- they can see you, too. By crouching or hiding behind cover you can obscure the tag and essentially make yourself invisible in a sort of “stealth” mode. The downside is that your mobility is severely hindered, and in the build we played, your teammates’ tags would also disappear when they were crouching, which made it tricky to differentiate between friend and foe. It’s also interesting to note that the winning team is not determined by the number of kills in this mode, but rather the team with the most money (which is dropped upon death) when the game’s timer hits zero. After a few miserable losses to the more experienced faceless Rockstar staff who were likely laughing in a room above us, we moved on to a Midnight Club-style mode called “GTA Race.” It’s pretty much what you’d expect -- the host will select the vehicle class, the area where you will race, the number of laps, and the time limit. Up to 16 players race from ordered checkpoint to checkpoint, and the vehicle that crosses the finish line in first takes the win. But there’s a twist -- you can go anywhere on that map that you choose, and do anything you want at any time. This includes, but is not limited to: getting out of your car/off your motorcycle and finding another vehicle; getting out of your car/off your motorcycle and firing a rocket at your opponents’ vehicles; or teaming up with other players to give other racers hell. It’s not hard to imagine things going south rather quickly, and during our play sessions it was almost immediately that one or two people veered from the race’s path to find ways to grief the racers. In Gran Turismo or Forza Motorsport this is frowned upon, and is reserved for foul-mouthed 13-year-olds and mouth-breathing basement dwellers. But it’s the natural choice in a game like GTA, and as long as you have a few people working towards the goal (the game may never end otherwise! ), this mode is a set-up for true comedy gold. Among the more exciting adversarial modes we played was a team-versus-team affair called “Cops N’ Crooks.” Just as it sounds, this mode places one team in the shoes of wanted criminals, and for the first time in a GTA game, the other team will play the strong arm of the Liberty City law. As the crooks, one player on the team is arbitrarily assigned the role of the “boss,” and the objective for the entire team is to get that particular player to safety. 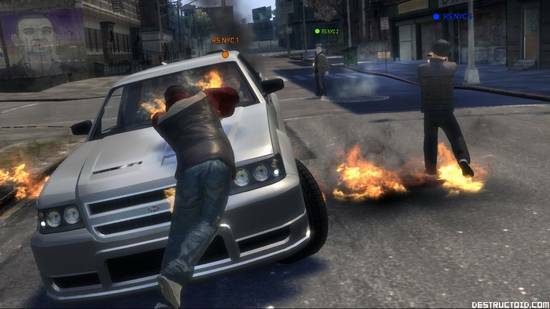 As the Liberty City police, the goal is to prevent this from happening at all costs, and the game ends when the boss either reaches safety or is snuffed out. 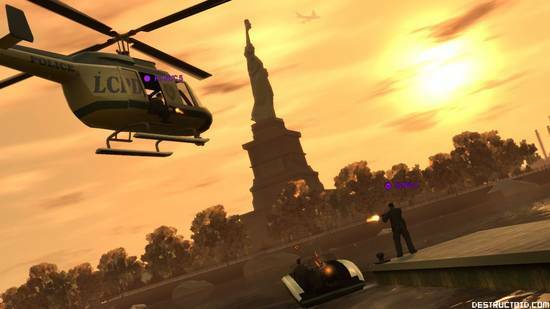 This mode takes place across the entirety of Liberty City, and is absolutely the most frantic mode we had a chance to fool around with. Playing as the cops, the crooks can be seen plainly on the radar, but the crooks can only see their escape point on the map. 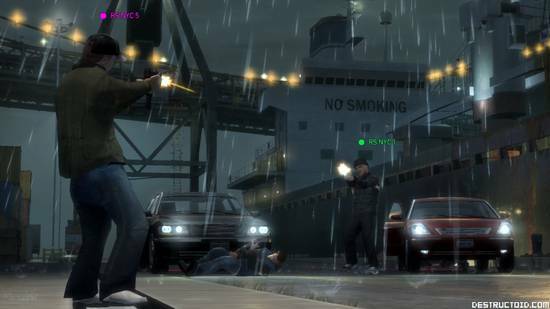 This creates an interesting cat and mouse situation, with each team trying to anticipate the movement of the other, which can be a monumental task considering that “Cops N’ Crooks” takes place across every acre of Liberty City. As such, finding and piling into a vehicle is key -- with one person driving, three other players can hang out of windows, firing their weapons at pursuing vehicles and persons. And on the side of the crooks, since everyone but the boss is expendable (they will respawn), we ran into a couple of hilarious situations where certain team members were left behind in a frenzied effort to escape death. The host of these games can set difficulty levels, and we went hands-on with everything from the easiest to the hardest, with the N.O.O.S.E. artificial intelligence getting smarter and more aggressive as we progressed. While the safe location was the same each time (an open baseball field, far from the airport), each scenario played out slightly different -- in one instance we used a stolen N.O.O.S.E. chopper to transport Kenny to safety, in another we jacked a more durable (but slower) armored car. The mission was fun to complete as a team, with some members focusing on taking out N.O.O.S.E. on foot, with others searching for getaway vehicles, or opening up routes to clear the path to safety. “Hangman’s NOOSE” was the only cooperative mission we were able to play, and while Rockstar didn’t comment on how many cooperative missions would be included on the disc when it ships, we were led to believe that there would be a handful. They were also mum on downloadable content, but missions like these seem ripe for digital delivery -- you can only play through one scenario so many times, and offering up additional scenarios via Xbox LIVE and PlayStation Network seems ideal. Visually, there’s an obvious downgrade from the single-player game, but it doesn’t really have a significant impact on the gameplay. The created avatars certainly aren’t as detailed as Niko or other single-player characters, and the textures and things like shadowing are ramped down noticeably. The trade-off, however, is a smooth multiplayer experience; we experienced no lag or framerate issues in our multiplayer sessions, which took place across Microsoft’s private Partnernet network. Whether or not this will translate well to a real-world Xbox LIVE and PlayStation Network remains to be seen. With the game shipping in three weeks, it looks like Rockstar are going to be quiet from here on out when it comes to revealing the remaining multiplayer modes. It’s only a matter of time before reviews and details start cropping up, but you may want to shield your eyes. Half the enjoyment of GTA is discovering things on your own, and it looks like Rockstar are looking to deliver a reasonably fleshed out multiplayer experience that shouldn’t disappoint fans. "GTA IV Week: Shooting and cover, Grand Theft Auto IV has them"